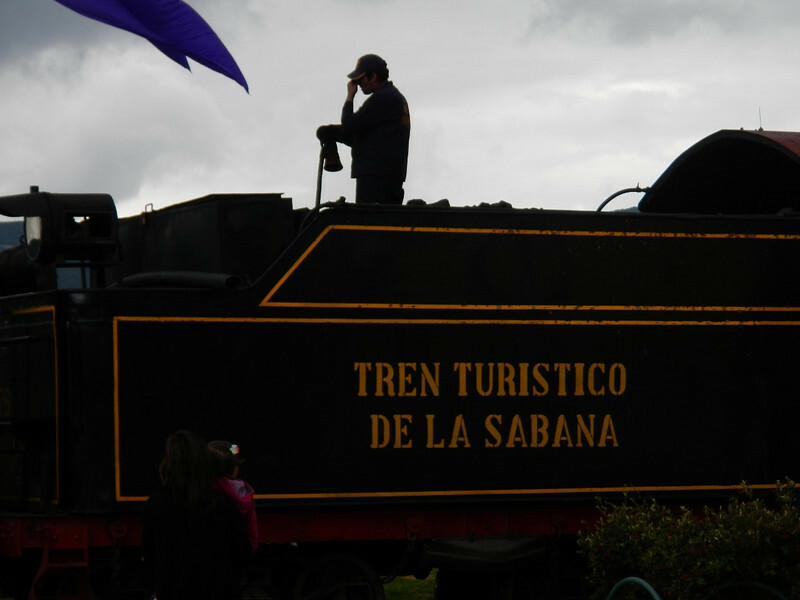 On Sunday we played tourista and bought tickets on a steam train to visit the Salt Cathedral of Zipaquira. The steam train was pretty cool. 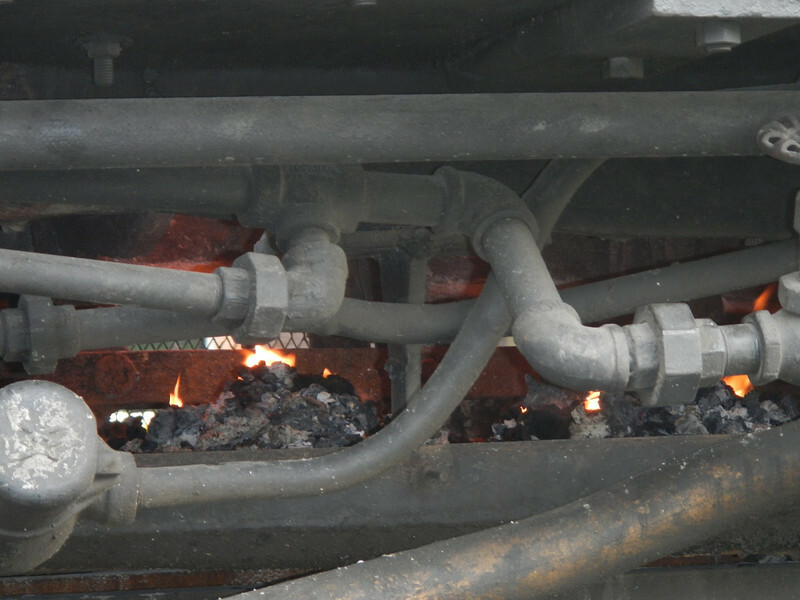 This was the real deal, complete with burning coal to fire the steam engine. Dave, ready to board the train. 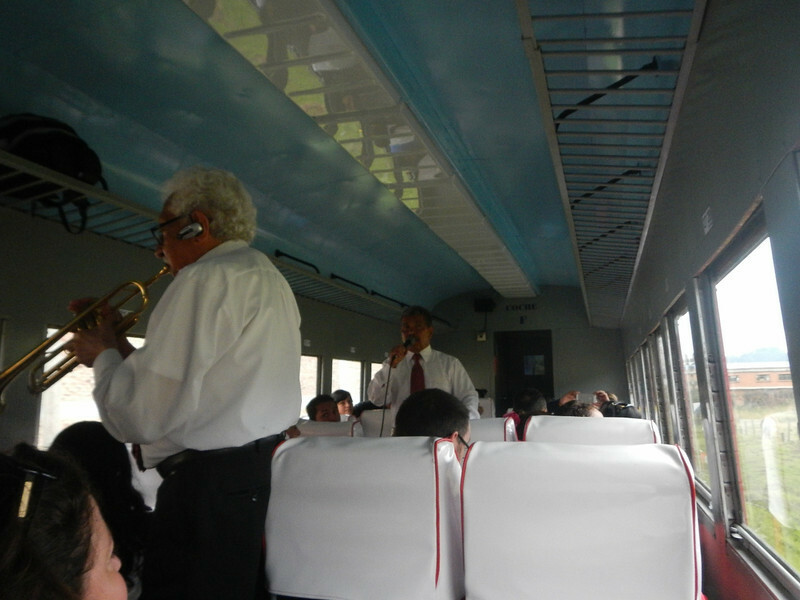 There was a fantastic band that came through the cars. 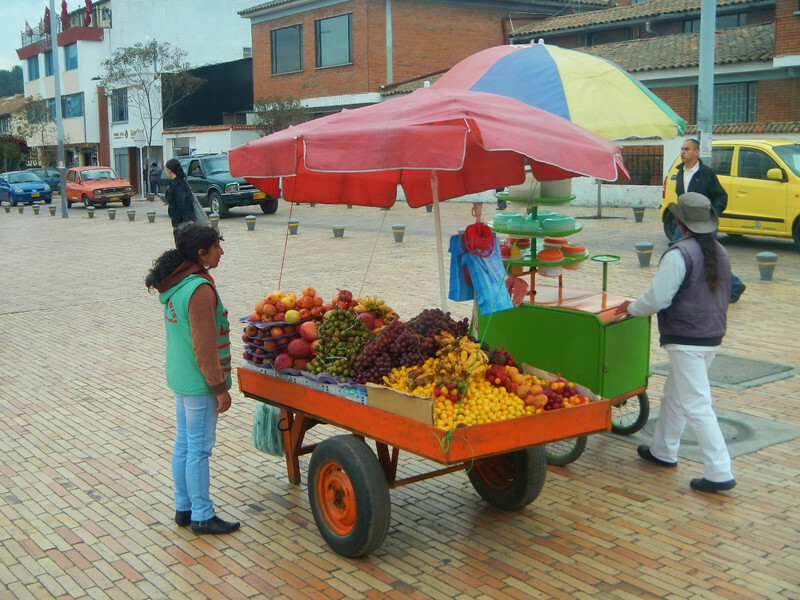 A colorful fruit cart at the station. 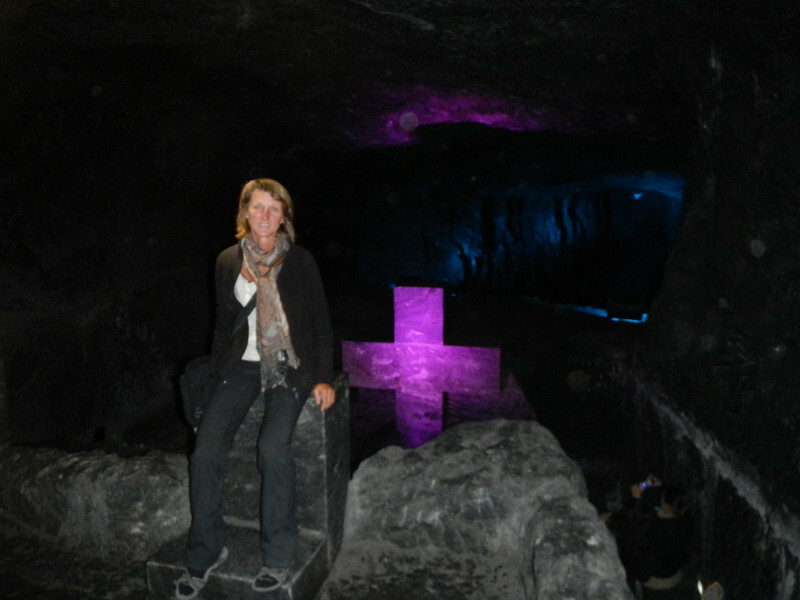 After a short bus ride from the train station we entered the Salt Mines that house the Salt Cathedral. You can read more about it HERE. 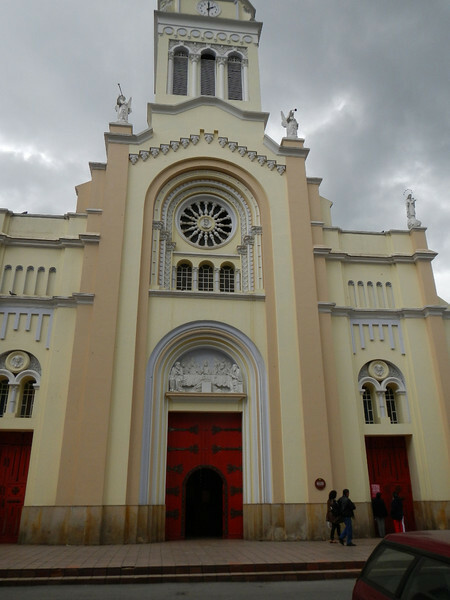 According to Wikipedia the miners had carved a sanctuary, as a place for their daily prayers asking for protection to the saints before starting to work. 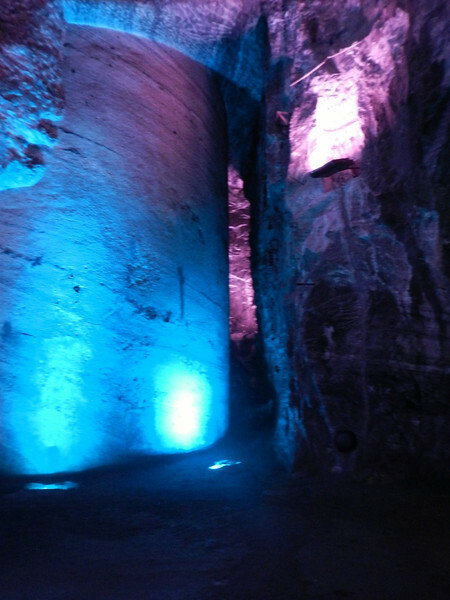 That was the start of the sanctuary in the caves. Today it’s expanded into an tourist attraction and the church is still a functioning institution. We walked down huge tunnels with stopping points with various shrines before entering the major hall with the main cathedral. 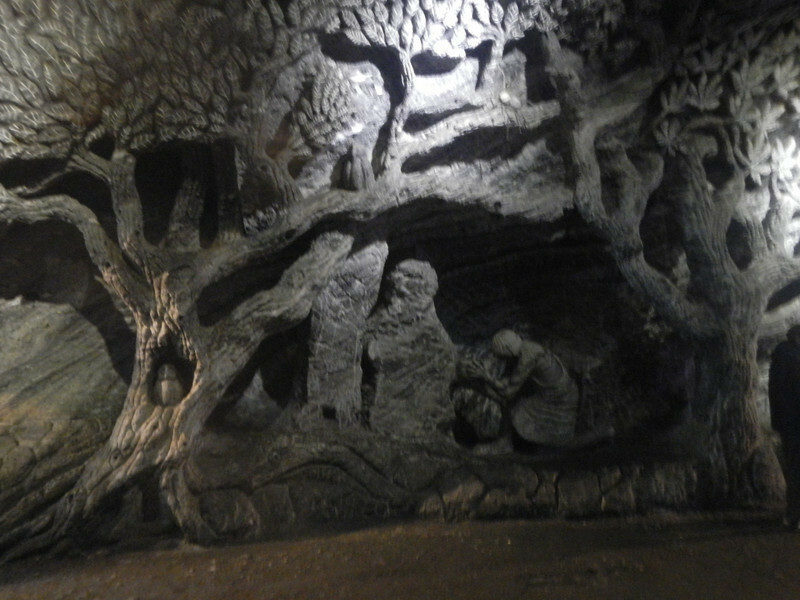 It was pretty cool just to walk around and check out the carvings. Photographs were difficult with my little camera. 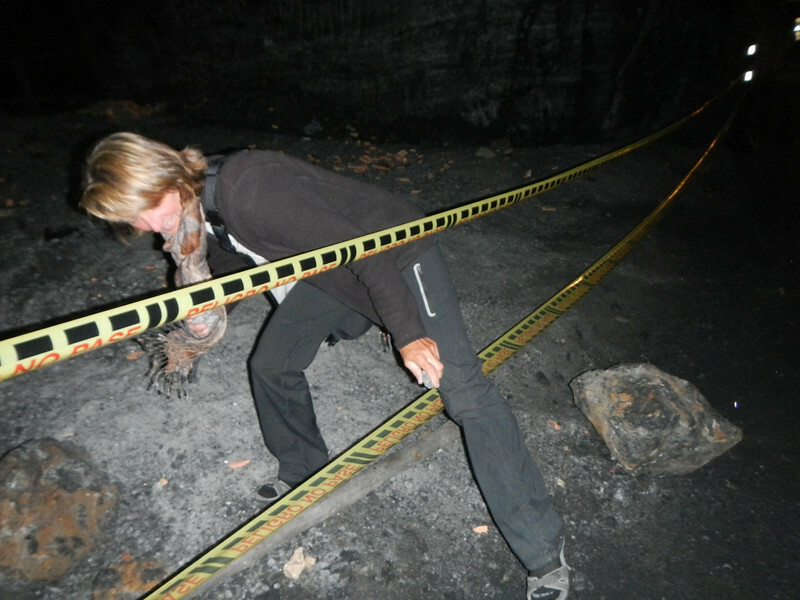 There were a number of blocked off shafts that exited from the main route. We found one particular shaft with loose rocks strewn about the floor, Deby to me to “watch for cops” and dove in looking for treasures. Pockets full she went to the nearest shrine to ask for forgiveness. 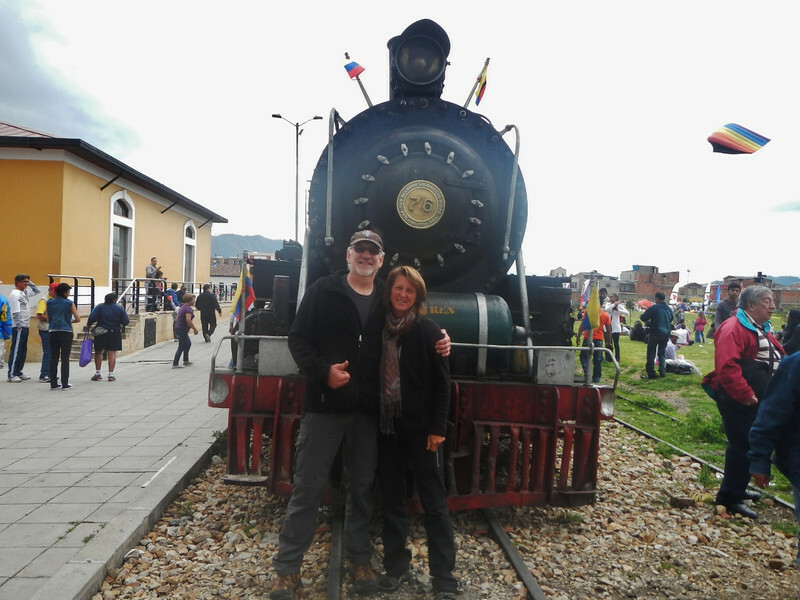 Back at the train we met a guy visiting from Texas who took our picture. 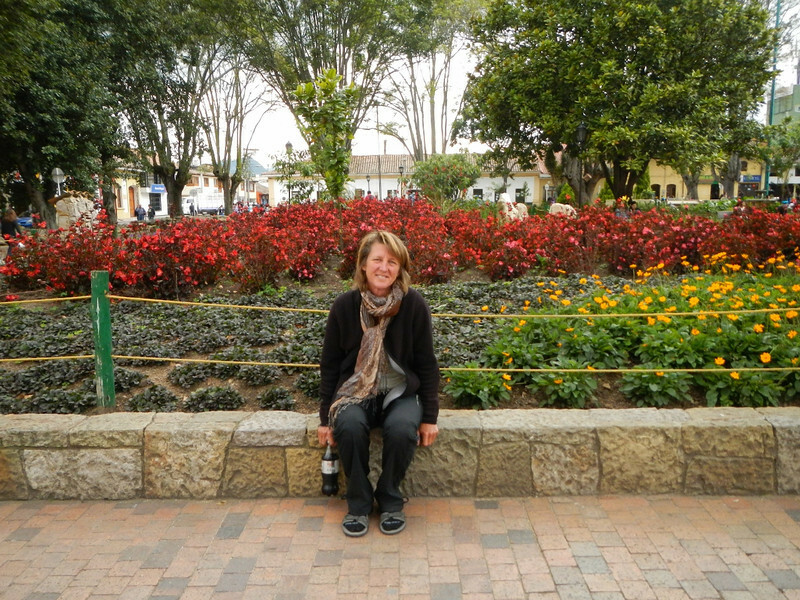 We had some time to kill before the train left so we checked out the Cajica town square. 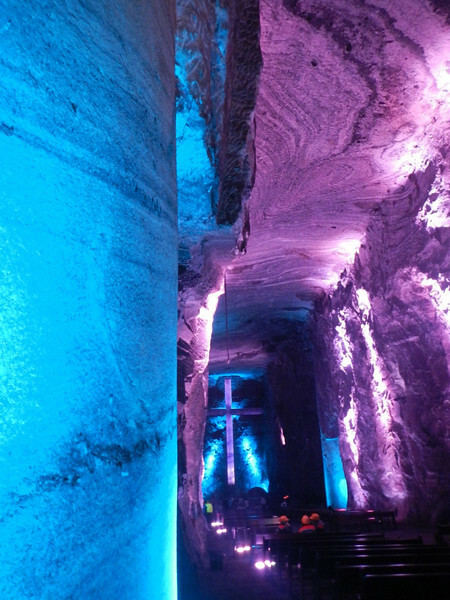 The local church for people who are too claustrophobic to attend services in the mine. Cool doors like we’ve seen on most of the churches on our trip. 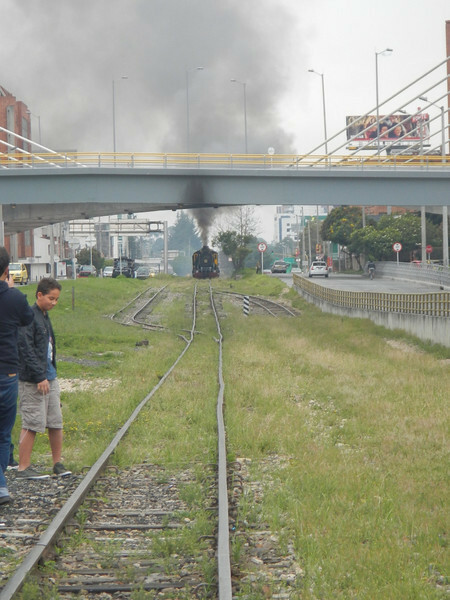 We knew the train was getting ready to go because the coal guy (fireman?) started shoveling coal and stoking the fire. 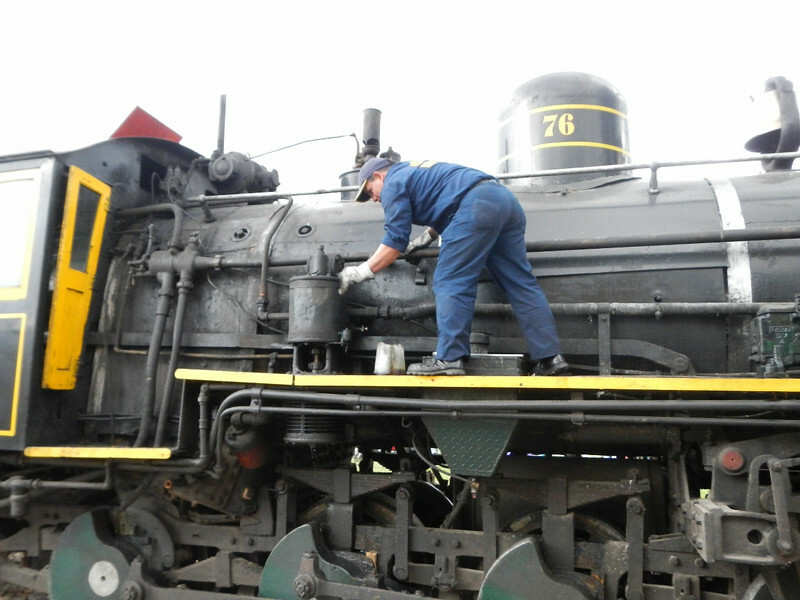 Another guy was doing something with a can of oil getting the engine ready. 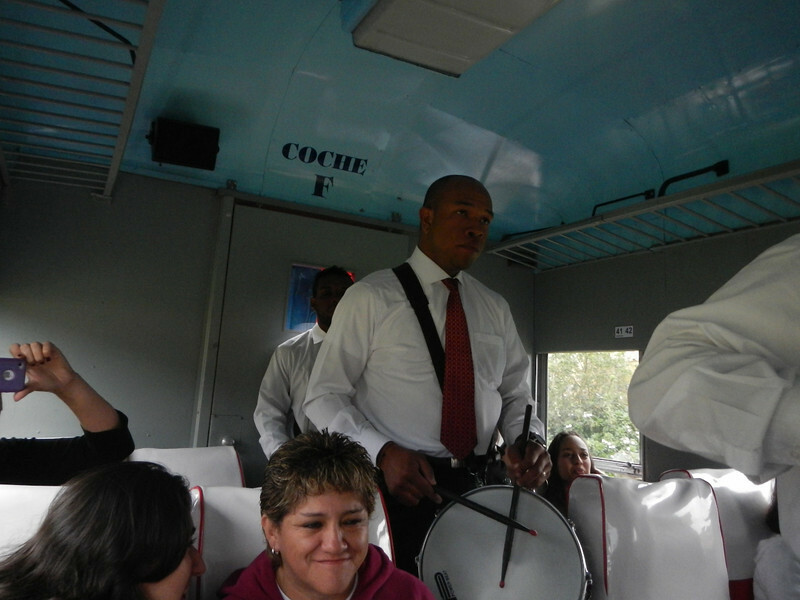 Soon we were on board for the hour long ride back to Bogota and an early night at the hotel. Watch for the next installment, on Monday we spent the day springing our bikes free from Girag and the Aduana process. 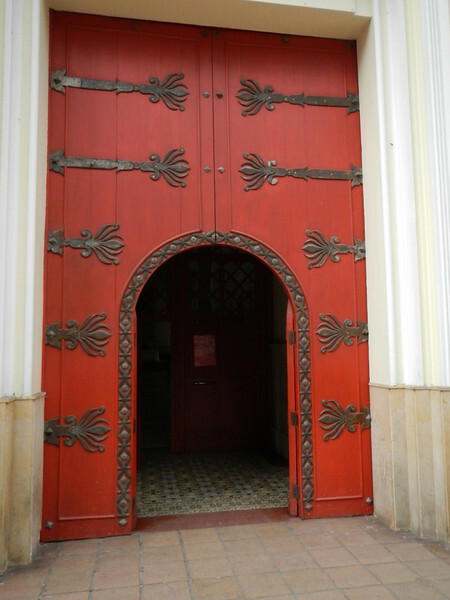 Great way to spend an off day……..
those church doors are so beautiful ! the salt carvings were amazing , too ! wonder how many times Deby’s had to ask for forgiveness as she was filling her pockets with with treasures ? that is funny ! I look forward each day to reading your posts. This adventure is so amazing. Thanks for all the photos and great writting. I wish I was as tough as all of you. Donn, you owe Deby a super woman outfit when you get back. The weather here is still cold wet and cloudy. Awesome ! 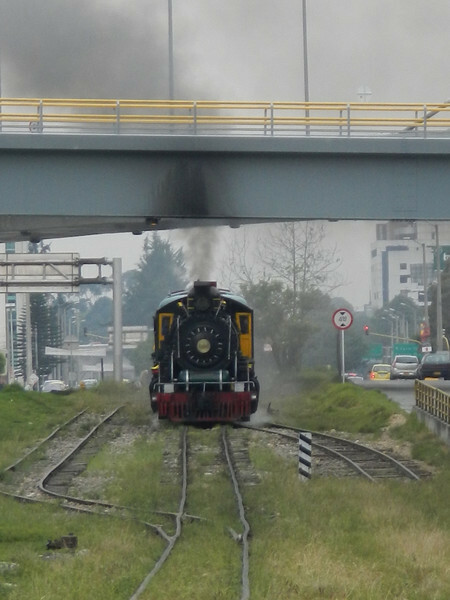 Do you know the vintage of the steam engine ? Hi Sal, No, I tried to look it up online and walked around looking for a date but couldn’t find anything. Did the salt berries taste like salt berries? You all are just fantastic…….can’t thank you enough for sharing the adventure, and, wow, it’s really a great one!! I’m sure Deb was forgiven. Love the salt carvings, chapel & church doors! 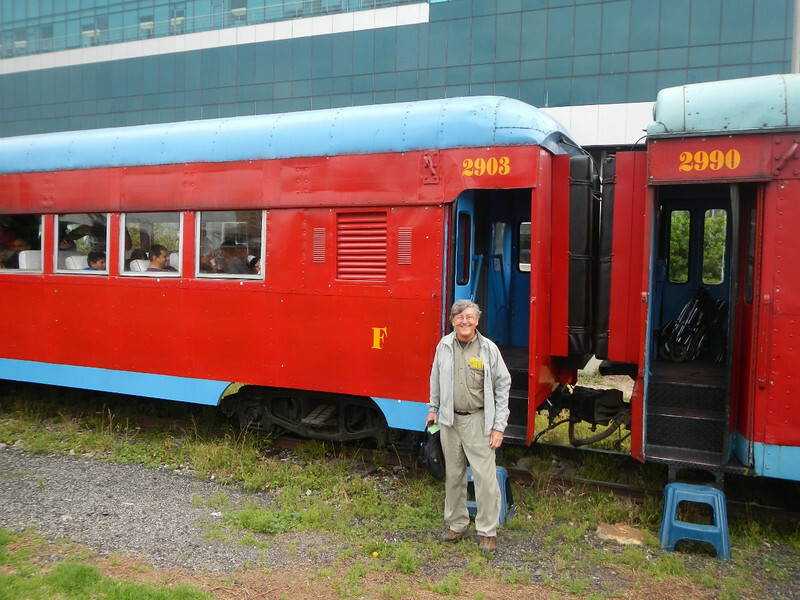 The train looked so fun too. What an amazing adventure you are having!! I always love your posts. I do believe your story of the rocks because Faye carried a bag full home from Guatemala. Guess that’s not the worst addiction.